Ever since I discovered Lululemon my first year out of high school, I have been obsessed with their athletic wear. Because the clothing is way out of my price range, I will admit I only have a few items from the brand. However, the items I do own, I absolutely love. Maybe the Lululemon fit, style, and quality has stolen the hearts of all is customers (as it has mine) and that is why they have such a profitable business. However, I think much of the success is credited to their very strategic business model. There are three distinct practices that I believe really sets Lululemon apart from its competitors. The first is empowerment. 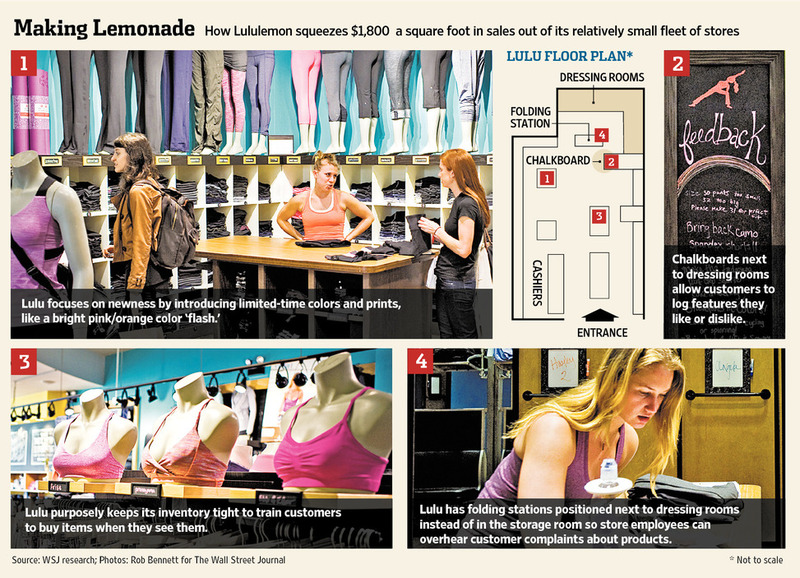 Lululemon stores are not meant to be simply a carbon copy of the some model store. Each manager of the individual Lululemon locations operates their store as if it were their own small business. The individual stores are not micromanaged by corporate. Instead, the Lululemon is highly decentralized. Furthermore, managers provide monthly feedback to the design departments. These correspondences between the individual store operators and the design team ensure that ideas and preferences of the managers have an opportunity to influence the next generation of products. This brings me to my next point: the community-focused approach of Lululemon. Each Lululemon store is expected to not just merely exist in its surrounding but to integrate itself into the community. One way our local Lincoln Park location does this is by offering free yoga classes to on Saturday mornings. Hospitable services, such as the free yoga sessions, build brand loyalty while also facilitating a great service to their community. The third distinct practice of Lululemon makes them so successful is keeping their inventory extremely scarce. Did you know that Lululemon is able to sell ninety-five percent of their inventory at full price? How many other retail stores do you know that can say that? Lululemon never has a huge amount of inventory on site because the main distributor does not over produce their products. But how do they know what is the ideal inventory? Well, the customers tell them. That’s right, some old fashion listening is the secret behind finding the ideal amount of inventory to have in store. The location of the folding tables is thoughtfully places neat the fitting rooms so employees are able to listen in on what their shoppers like and don’t like about the product. If several people are complaining about an awkward fit of a particular shirt, the employees are trained to notify their manager would can avoid ordering any more of that item. The company also is able to learn from their mistakes and therefore, if all goes as planned, avoid making such mistakes again. It sounds like a very interesting premise for a company. The decentralized nature that you mentioned is probably what most corporations should aim for. As someone who has worked in the retail and hospitality industry, it sometimes feels as if corporate is out-of-touch with the customers in the store’s area. Offering an in-store service to build brand loyalty also seems very unique for a retail clothing store. From the sounds of it, it seems like the higher prices of Lululemon allow them to offer more to the customers in return. I had never known this about Lululemon but it’s all very interesting. Everywhere you go you see people with the Lululemon bag or a Lululemon outfit. I had always wondered how they were able to be so successful despite high prices. Their management model is very unique and creative. I think it’s important that each store has its own individual flare. Stores can be geared toward the right customer demographic no matter what the location since there are few restrictions. I think that it’s an excellent idea to place the folding tables near the dressing rooms. One sure way to know what the customer thinks about a product is to hear their honest opinion. Lululemon doesn’t solely focus on being a business, but they also focus on being a part of the community. I think it’s things like the free yoga sessions on Saturday that keep people coming back and willing to pay higher prices. I think this management model will continue to be successful for the company. During every group exercise class I attend, I notice that the majority of women in the class are sporting Lululemon clothing. This post provides insight into why such an expensive brand is thriving. Because Lululemon is highly decentralized, each store has a personality, which lures people in to discover the changes. Creating a small supply of each product then creates a sense of scarcity that positively pressures customers to purchase items quickly. In addition to these successful marketing techniques, I think that the placement of folding tables and free in-store services for the community are innovative ways to build a brand identity. I wonder why more companies do not use these strategies. I think this is a great post for operations management because it shows how a relatively young company is taking a new approach in the strategic business model. As the previous comments have pointed out, the decentralization of managers of the stores from corporate office is an undeniable strength of Lululemon. The ability for each store to have its own unique flare and manage its store so that it is focused on the wants and needs of the customers is what makes Lululemon a great organization. It’s the Lululemon edge: uniqueness, customer loyalty, and a great atmosphere. The ability of the company to do so much with a small layout empowers them to create a business unlike any other. Obviously this strategy is working, because what other companies sell nearly 95% of their inventory at full price? The reward for this is granted back to the customers of Lululemon by the company offering free yoga classes, more personal production due to the needs/wants of customers, and a great fan base. Lululemon is a prime example of how breaking from the norm is empowering and can truly help a company. How do you think other industries; such as restaurants, entertainment, or technology companies, can learn from Lululemon and develop a more unique management style that has such great profits for doing what the company loves to do? Do you think that the novelty of Lululemon will be sustained for many years, why/ why not? As a previous employee of a retail corporation, I believe that Lululemon’s structure is very unique. Corporation executives are often so focused on sales that they are very out of touch with trends that occur at their locations. There are several products that, as a representative working on the sales floor, I could have recommended a restocking of. While Lululemon focuses on keeping inventory levels low, allowing them to sell the majority of products at full price, they could often be losing out on sales in certain stores. I do find these ideas interesting and I think they work well for the athletic clothing industry because of the short life cycle of products. However, not all industries would thrive with this type of management model. Wow, I did not realize this about Lululemon at all. I have never purchased from the high-end retailer, and do not plan to in the future though have noticed a drastic take over in this brand. Specifically interesting to me was the fact that their business model does go much deeper than what I had previously expected. I find it very clever that their 3 distinct practices are thoroughly implemented in each store because in my opinion it is the management and employees of a small store that truly make it profitable. The 3 practices coupled with each store acting as its own stand a lone small business definitely is the “secret sauce” that has helped Lululemon to become so profitable. Additionally, I am shocked to find out how elaborate their floor plans are to most effectively use space and better understand their customer set. I am interested in hearing from other buyers of Lululemon and their reasons why the do/do not purchase from this popular store. Additionally, I wonder if they think this business model truly is implemented in stores they have been to as I have never entered one of their stores. I am a huge fan of Lululemon because it is unlike other retail stores I have ever seen, it is highly decentralized. While most retail stores are based on control and strategy, Lululemon provides its customers flexibility with an exclusive community-approach. I do not own a lot of Lululemon merchandise and it is because everything there is super expensive, however, it is durable and worth every penny. Also, now that this blog informed me about how 95% of the inventory the store sells is at full price makes much more sense why I do not ever come across sales at this store, wow. I think the management model that Lululemon is using right now such as low inventory levels, reasonable prices, the feedback boards (which I have used a couple times), employees communicating what they hear to their managers which helps improve Lululemon, and the free yoga classes (my favorite) for its loyal customers is great and works well for them, where as I can see why it would not work as well for a different retailer. I think Lululemon should be used as an example of how all retail stores should be managed. The mere fact that feedback is so highly valued, makes it that much more appealing to it’s customers. I love being able to walk into the store, try on an outfit, and have people actually listen to my opinion on the product. They also have custom tailoring for people who do not want to pay another fee to shorten their new yoga pants. Another thing that sets them apart is that they take time to close down for yoga class once a day. Most stores would cringe at the idea of closing their doors for an hour in fear of losing profit. Lululemon shows incredible leadership by showing customers that they are not just a clothing store, but actually take action to show that they want to improve lifestyles and the community. They have truly mastered the idea of brand loyalty, and I believe this is something that will be sustainable for years to come.